Hair scrunchies are made from 100% velvet. They are comfortable and soft and durable! Tie them around your ponytail, add them to the end of a braid or around the base of a bun. 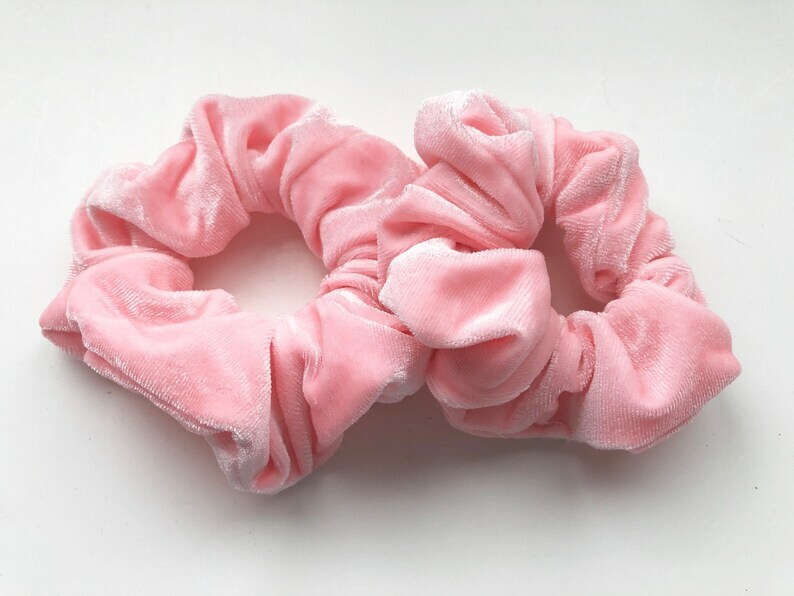 Hair scrunchies are carefully sewn and come in a variety of colors. They can wrap around your hair 2-3 times (depending on the thickness of your hair) without snagging, pulling or leaving a mark. You will get the scrunchie shown in the first picture. I really love these. I use them to hold essential oil roller bottles and they fit really well! Thank you! We accept payment with PayPal and all major credit cards. If you are not 100% satisfied with your purchase, please contact us within 10 days from the date purchased. All our shipping is done via USPS 1st Class Mail. Normally it takes between 2-5 days for your package to arrive. If you need it to arrive sooner please let me know so I can adjust for Priority Mail. All shipping is done the day after payment is received unless it's a weekend. I use USPS 1st Class Mail for packages weighing 15oz or less. Priority Mail is used for heavier packages. Listed shipping costs include the actual postage cost plus a small handling fee. Sorry we DO NOT ship internationally. All packages will ship to the address provided when you check out. It is your responsibility to update the address on file. No packages will be shipped to an address other than the address given at checkout. Once your package leaves my hands I cannot control how it's handled. If your package arrives damaged or is lost in the mail you must file a claim with your local post office. Lots of you don't know but leaving feedback is an essential part of Etsy. It also lets me know you got your package and are satisfied with your product. When your package arrives PLEASE leave me feedback even if you aren't happy.